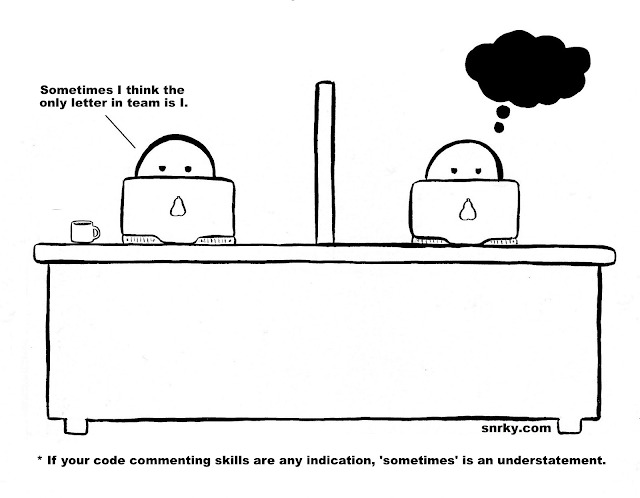 Snrky: If the quality of your code comments are any indication, 'sometimes' is an understatement. If the quality of your code comments are any indication, 'sometimes' is an understatement. I can honestly say I have never put too much thought into "what makes a good comment". Maybe it's because their existence, usefulness, and general importance for code comprehension has always been obvious to me, or maybe because I'm rather terrible at using them consistently so would prefer not thinking about it. Regardless of my reasons, I foundCoding Horror's thoughts on comments enlightening, particularly his very first point -- the best comments are the one's you don't need. Title: If the quality of your code comments are any indication, 'sometimes' is an understatement. Snarky: Sometimes I think the only letter in team is I.